This paper uses cross-sectional survey data to evaluate the farmers’ perception and knowledge of health risks in urban wastewater irrigation in Nairobi, Kenya. In order to identify the determinants of farmers’ perception on health risks of wastewater irrigation to farm workers and consumers of produced vegetables, analysis of the study used the ordered probit model. The results show urban and peri-urban farmers are aware of health hazards attributed to untreated wastewater irrigation. Empirical estimates indicate that age, gender, household size, education level, farming experience, credit access and farm income are key determinants of farmers’ perception on health-related risks due to wastewater irrigation. Therefore, there is need to sensitize the urban and peri-urban farmers about the health hazards and risk-reduction measures in wastewater irrigation. Additional research is required to analyse the health-risk perception of urban consumers of leafy vegetables in Kenya. This will provide additional information to decision-makers for policy formulation in wastewater irrigation by considering the demand side in the agricultural sub-sector. Keywords: ordered probit model, peri-urban farmers, risk perception, untreated wastewater, wastewater irrigation. Copyright: © 2013 Ndunda, E. N & Mungatana, E. D. Creative Commons Attribution 3.0 Unported License. The significance of urban and peri-urban agriculture for livelihoods of many poor people has received a growing recognition over the last decade. The practice contributes immensely towards food security among the urban poor, mainly in slums. However, the global fresh-water scarcity is estimated to be 60 percent by 2025 due to current demographic trends (Qadir et al., 2007). This necessitates the water-scarce countries to rely increasingly on the unconventional resources to meet the growing water demand. Wastewater is an alternative source of water that can be utilized to complement other conventional sources of water. In many developing countries, untreated or partially treated urban wastewater is commonly used for irrigation agriculture. Previous studies show that wastewater resource is increasingly emerging as a viable alternative to conventional water sources in water-scarce countries (Buechler & Devi, 2006; Drechsel et al., 2006; Ensink et al., 2003; Menegaki et al., 2007; Mojida et al., 2010; Qadir et al., 2010; Rutkowski et al., 2007; Srinivasan & Reddy, 2009; Van der Hoek, 2004). Although the wastewater irrigation is a reliable source of water and crop nutrients, the practice poses various health and environmental hazards (Rutkowski et al. 2007). Kenya is faced with severe scarcity of freshwater resources, as a result of growing water consumption, heavy pollution of the available water resources, degradation of the environment, extreme exploitation of natural resources, and climate change (NEMA, 2011a; GoK, 2010). Also, rapid urbanization, industrialization and population growth have significantly contributed to the decline of available water resources. Sewage infrastructure in the urban and peri-urban regions of Nairobi, like in most cities in sub-Saharan Africa, is largely inadequate. Wastewater generated in the city is treated in Kariobangi and Dandora sewage treatment plants, which have daily treatment capacities of 32,000 and 80,000 cubic metres respectively (ECFA, 2008). This constitutes less than half of the total amount of wastewater produced in the city per day. Since the untreated wastewater is discharged into the environment, most of the freshwater resources in Nairobi are heavily polluted (Cornish & Kielen, 2004; Dulo, 2008; NEMA, 2011b). Also, the raw municipal and industrial effluents are conveyed into rivers through natural drainage channels thus contributing considerably towards pollution of freshwater sources. Urban and peri-urban farmers in Nairobi use the untreated wastewater for irrigation of vegetable crops. Therefore, Nairobi municipality offers an important case study to evaluate how urban and peri-urban irrigation agriculture has been practiced to combat food insecurity among the urban poor. In order to inform the policy-makers on aspects pertaining to wastewater irrigation, a better understanding is required about the farmers’ perceptions on health risks of wastewater to farm workers and consumers of produced vegetables. The core objective of this study was to assess perceptions of direct and indirect users about the health hazards of wastewater irrigation. In order to achieve this objective, this paper sought to understand the views of farmers about wastewater reuse, the perceived measures to reduce the negative effects of wastewater irrigation, and the determinants of the negative perceptions. The recognition of wastewater as a sustainable alternative to freshwater for irrigation is generally low among decision-makers in many less developed countries (LCDs) (Qadir & Scott, 2010). This may be partly described by lack of adequate and dependable information about wastewater reuse for agriculture in developing countries since the practice is considered obnoxious. In Kenya, the reuse of either treated or untreated wastewater for irrigation agriculture is not recognised by the National Environmental Management Authority (NEMA). This is regardless of the fact that wastewater can greatly contribute in ameliorating the availability of irrigation water for urban farming in the country. Although wastewater reuse in Kenya is illegal, over 50 percent of wastewater generated in Nairobi is used for crop production without any form of treatment (ADB, 2010; UNEP 2003). It is estimated that about 30 percent of the city dwellers are engaged in urban and peri-urban agriculture (Canada, 2011). This has made it difficult for the decision-makers to control the health and environmental risks attributed to the practice since it is a source of livelihood for thousands of poor urban dwellers. An integrated management approach that would include all stakeholders is likely to help in reduction of health and environmental hazards while sustaining productivity of many crops in many urban areas. Therefore, an assessment of perceptions of farmers on wastewater irrigation is important in order to evaluate their awareness of the associated health and environmental risks for policy decisions. Although the acceptance of wastewater for reuse through participation by stakeholders has been extensively covered in literature (Hamilton et al., 2007), there is still a research gap on the perceptions by distinct groups of users. There is limited knowledge and perceptions literature on the risks of health and environmental risks associated with wastewater irrigation agriculture (Faruqui et al., 2004). This study hypothesizes that, socioeconomic characteristics of direct and indirect wastewater users significantly influence the perception on health risks to farm workers and consumers. The study was carried out in Kibera slum in the Nairobi County, Kenya. Nairobi, the capital city of Kenya, has an urban population of about 3.4 million people (Brinkhoff, 2010; KNBS, 2010a). Majority of these people lives in densely populated informal settlements such as Kibera, Mathare, Korogocho, Mukuru kwa Njenga, and Maili Saba slums. Kibera slum was selected for this study because it is one of the major areas in the city where thousands of poor farmers rely on wastewater for irrigation agriculture. The slum is one of the most populated informal settlements in sub-Saharan Africa with a mean population of about 700,000 people (Umande Trust, 2012). Kibera slum has 11 villages and has a population density of approximately 1,250 persons per hectare. Most of the leafy vegetables produced with the untreated wastewater (about 75 percent) are marketed locally. Also, some of the urban and peri-urban farmers keep livestock for economic purposes. The Motoine-Ngong River and Nairobi Dam have restricted the expansion of Kibera slum to the south and east, while the railway line to Kisumu has limited the slum growth to the north and west. Also, the building process in this informal settlement has been made difficult by the hilly and steep terrain. However, the slum dwellers have encroached on the riparian areas of the river system hence posing serious environmental challenges. The water quality in Motoine-Ngong River has been extensively degraded by rampant disposal of solid waste, human waste and wastewater from the slum. In Kibera slum, some pit latrines are inaptly constructed near the water sources thus threatening the public health. Poor sanitation in the slum has immensely contributed to a vicious cycle of water pollution, water-borne diseases, poverty, and environmental degradation. The conversion of riparian areas for agricultural activities has resulted in ecosystem degradation thus resulting in wide biodiversity loss, accelerated soil erosion and increased turbidity in the river system. This study used the stratified random sampling method to collect survey data from farmers in Kibera slum who rely on wastewater for irrigation agriculture. A total of 317 farmers were selected randomly and interviewed for this research from December 2011 to March 2012. The two strata for this study were: farmers who irrigate with untreated wastewater directly and those who irrigate with the resource indirectly. This helped in assessing whether wastewater irrigation practiced by urban and peri-urban farmers has effect on their attitudes towards the resource. The farmers who irrigated with undiluted wastewater were defined as direct users while those who relied upon polluted water sources were defined as indirect wastewater users. A stratum of direct wastewater users comprised of which included 150 farmers while that of indirect wastewater users consisted of 167 farmers. The focus group discussions with carefully selected members of the farming community were preceded the formal interviews with the respondents. This provided an opportunity for farmers and interviewers to develop a trustworthy relationship for dialogues about the sensitive topic on wastewater reuse in agriculture. Also, the focus group discussions enabled the identification of positive and negative attributes of wastewater as well as a list of possible risk-reduction measures. In order to obtain responses from the farmers, semi-structured questionnaires were administered to the randomly selected sample. The questionnaires were used to obtain demographic and socioeconomic information, as well as attitudes and knowledge of farmers with respect to wastewater reuse for irrigation agriculture. In order to obtain the required information, likert-scales and open-ended questions were presented to the respondents with the help of trained enumerators. The farmers were asked about their perceived benefits and risks of urban and peri-urban wastewater irrigation. Also, the respondents were requested to suggest some possible solutions to the identified risks linked with the practice of direct and indirect wastewater irrigation. This study measured the perception of farmers about benefits and risks of wastewater reuse for irrigation agriculture. The considered positive characteristics of wastewater included the following: wastewater is readily accessible compared to freshwater; wastewater is proximate to farms; wastewater supports high crop yields; wastewater enhances the structure of agricultural soils; and wastewater is a strategic source of crop nutrients. The analysed risks linked to wastewater reuse in agriculture are: awful persistent stench; diarrhoeal diseases; worm infections; skin irritation and blistering; destruction of irrigation systems; soil degradation; crop pests and diseases; wild growth of weeds in farms; contamination of food; and pollution of groundwater. In order to quantify the perception of interviewed respondents, a weighted mean index (WMI) was calculated (Equation 1). This involved an analysis of the degrees of perception based on the responses from five-point likert-scales with weights that changed according to the scales. In this study, the weights assigned to likert-scales were such that: strongly disagree was weighted as -2, disagree as -1, not sure as 0, agree as 1, and strongly agree as 2. The t-test was applied to test for statistical significance of the difference between the WMI of farmers who use wastewater for irrigation agriculture directly and those who use the resource indirectly. Where Qi is the response rate to the ith factor, Wi is the weight of the ith factor and K is the overall number of responses. The maximum likelihood technique that provides consistent and asymptotic estimators can be used to jointly estimate the vector of parameters β and thresholds μ. The thresholds μ indicate an array of the normal distribution related to definite values of the explanatory variables. Parameters β denote the influence of variation in response variables on the principal scale. According to Green (2008), the positive sign of parameter β implies greater health threats associated with wastewater irrigation as the value of related variable increases. Where Φ is the cumulative density function (CDF) of a standard normal random variable. Table 1 provides a summary of the socioeconomic characteristics of the direct and indirect wastewater users in the Motoine-Ngong River basin. Farmers who practice indirect wastewater irrigation have a higher mean age (41.16 years) compared to those who practice direct wastewater irrigation (39.27 years). However, both groups of urban and peri-urban farmers indicate that the wastewater irrigation agriculture in the study area is undertaken by young farmers who are economically active. The results of this study show that the indirect wastewater users have an education of 8.73 years while the direct wastewater users have an education of 8.21 years. This shows that the two groups involve farmers with basic education. The farmers who practice indirect wastewater irrigation have households whose average size is 4.59 while the ones who practice direct wastewater irrigation have households whose mean size is 4.81. The mean household sizes of the two groups are higher compared to the national average, which is 4.1 persons per household (KNBS, 2010b). However, the household sizes for the two samples compare well with the average size of Kibera slum which is currently estimated at 5.0 persons per household (Umande Trust, 2012). The indirect wastewater users have a farming experience of 6.74 years while the direct wastewater users have a farming experience of 6.86 years. This shows that the farmers who are engaged in wastewater irrigation agriculture in the study area have considerable experience. Hence, it can be deduced that the interviewed farmers had reliable information concerning the benefits and challenges faced in the practice of wastewater reuse. The interviewed respondents in both urban and peri-urban areas were engaged in wastewater irrigation agriculture in small plots. The indirect wastewater users had a mean farm size of 0.49 acres while the indirect wastewater users have plots of 0.57 acres. This limited ownership of small parcels of land may be partly attributed to enormous population of farmers competing for limited land size in the study area. In both groups of wastewater users, male farmers dominated the sample size. The results show that 77 percent of indirect wastewater users are men and 80 percent of direct wastewater users are men too. Therefore, only a few female farmers are involved in urban and peri-urban irrigation agriculture whereby wastewater is utilized for growing vegetable. This may be due to the labour requirements in crop production, which may have forced them to seek alternative activities which are less labour intensive. The direct and indirect reuse of wastewater for irrigation agriculture has several benefits to urban and peri-urban farmers. 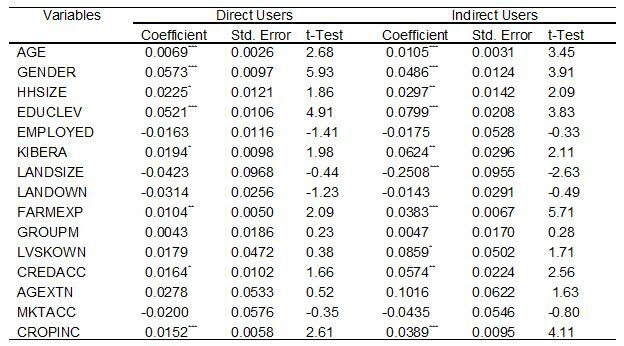 In order to compare the responses of direct and indirect users, weighted mean indices were computed in Table 2. The results show that both the direct and indirect users of wastewater for irrigation agriculture agree that there are no other available sources of water. This is because the population in Kibera slum lacks basic services and infrastructure such as adequate access to water, sanitation, storm drainage and garbage collection (UN-habitat, 2009). 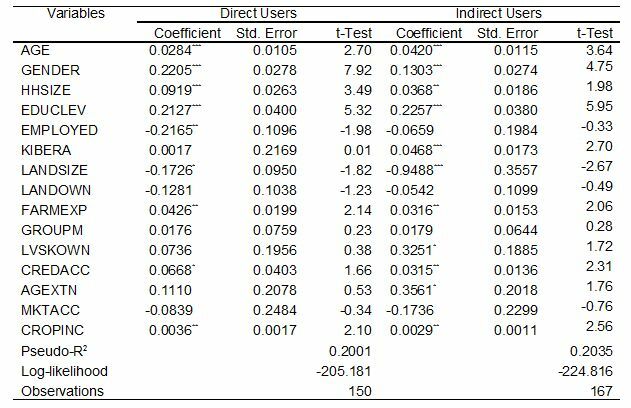 However, the degree of agreement among the direct users was higher and significantly different from that of indirect users. The direct and indirect wastewater users agreed that wastewater was readily accessible near the farm. The degree of agreement is significantly higher for direct users than for indirect users of the wastewater. This may be mainly linked to the fact that most of the farm households in Kibera slum depend on the heavily polluted water from the Motoine-Ngong River and the Nairobi Dam for irrigation agriculture (Karanja et al., 2010). Farmers engaged in indirect and direct reuse of wastewater agreed that the resource ensures high yield of the grown crops. The degree of agreement for direct users is higher than for indirect users and significantly different. Farmers who reuse wastewater directly had higher and significant degree of agreement than the farmers who indirectly use wastewater. Farmers who directly irrigate with wastewater and those who indirectly use wastewater agree that the resource use improves structure of agricultural soils. Although the degree of agreement is higher for indirect users compared to direct users, the difference was insignificantly different between the two groups of farmers. Farmers in this study agree that wastewater is a strategic source of nutrients for crop production. The motivation for wastewater reuse in crop production is because of its high nutrients content (Table 5), which results in reduced production cost compared to other available sources (Keraita & Drechsel, 2004; Qadir et al., 2010). However, there is need for the farmers who use wastewater for irrigation agriculture to be adequately educated on the best practices in order to minimize the health and environmental risks. In this study, the wastewater users were requested to self-report on the incidences of wastewater related enteric infections in their families within a month before the survey. This was mainly because farmers who use untreated of partially treated wastewater for irrigation agriculture are exposed to various types of diseases (Carr et al., 2004; Drechsel et al., 2010; Scott et al., 2004). The infections reported by direct and indirect wastewater users are: diarrhoea, stomach-ache, intestinal worms and skin infections (Table 3). In the sample of farmers surveyed, there were 20.82 percent of direct wastewater users and 25.55 percent of indirect wastewater users who reported diarrhoeal infections on at least one household member within a month prior to the survey. The diarrhoeal infections may be as a result of exposure to pathogenic micro-organisms from the wastewater through direct consumption of foods produced with polluted water (Scott et al., 2004). There were about 14.51 percent of direct wastewater users and 16.40 percent of indirect wastewater users that reported that at least one member of their households suffered severe stomach-ache within a month prior to the day the questionnaire was administered. These infections can be liked to unsafe reuse of wastewater for irrigation agriculture (Blumenthal and Peasey, 2002). The study reported that 22.40 percent direct wastewater users and 21.77 percent indirect wastewater users had one or more of their household members infected with intestinal worm a month prior to the survey. The exposure to wastewater and polluted soils may contribute to worm infections among farm workers (Ensink, 2006). Also, 26.81 percent of direct wastewater users and 23.66 percent of indirect wastewater users reported skin infections, such as itching and blistering on the hands and feet, on at least one household member a month prior to the survey. This may be attributed to lack of adequate protection from exposure to polluted water during irrigation (Keraita et al., 2008). However, it may be difficult to attribute these infections to wastewater irrigation alone since many other sanitation factors are likely to cause enteric diseases. The perceptions of farmers on various factors in the use of excreta for crop production were sought in this study as shown in Table 4. Farmers agreed that direct and indirect wastewater reuse had an awful persistent stench. The degree of agreement for direct wastewater users was higher and significantly different from the indirect wastewater users. Similarly, there was agreement between both groups of farmers on the perceived risk of diarrhoeal diseases as a result of wastewater irrigation. However, the degree of agreement was higher for direct wastewater users as compared to indirect wastewater users although the groups were not significantly different. Also, direct wastewater users agreed more than indirect wastewater users to the perception that the practice caused worm infection as well as skin irritation and blistering. The degrees of agreement were significantly different for both categories of users with respect to the perceived worm and skin infection. This risk perception is confirmed by high content of Chromium in the irrigation wastewater, which may cause dermatitis to wastewater users (Nabulo, 2006). Similarly, the farm workers are at high risk of being infected with intestinal nematode as a result of using the wastewater for irrigation agriculture (Blumenthal & Peasey, 2002). This study also analysed the perceived effect of untreated wastewater on the irrigation systems was analysed. Direct and indirect wastewater users agreed that the reuse of wastewater for crop production damages the irrigation systems. The degree of agreement for direct wastewater users was higher and significantly different from that of indirect wastewater users. This may result from high levels of Total suspended solids contained in the untreated of partially treated wastewater, which results in clogging of drip irrigation systems (Ayers & Westcot, 1985; GoK, 2006; Pescod, 1992). Similarly, the high pH of the irrigation wastewater together with wild algal growth as a result of eutrophication may lead to clogging of the irrigation systems (Liu & Huang, 2008; Duran-Ros et al., 2009). The direct and indirect wastewater users disagreed that the reuse of wastewater for irrigation causes soil degradation but the degree of disagreement was higher for direct wastewater users and significantly different from that of the indirect wastewater users. Both the indirect and direct wastewater users agreed that crop pests and diseases are increased by the wastewater reuse for irrigation. The degree of agreement was higher for direct wastewater users than for indirect wastewater users but not significantly different. Farmers involved in direct and indirect wastewater reuse for irrigation agreed that the resource utilization causes proliferation of weeds. However, direct wastewater users had higher and significantly different index compared to the indirect wastewater users. The high levels of nitrogen, phosphorus and potassium (NPK) in the irrigation wastewater might be a factor in eutrophication (Fattal et al., 2004). Farmers who indirectly or directly use wastewater for irrigation agriculture did not agree with the assertion that wastewater reuse results in food contamination. 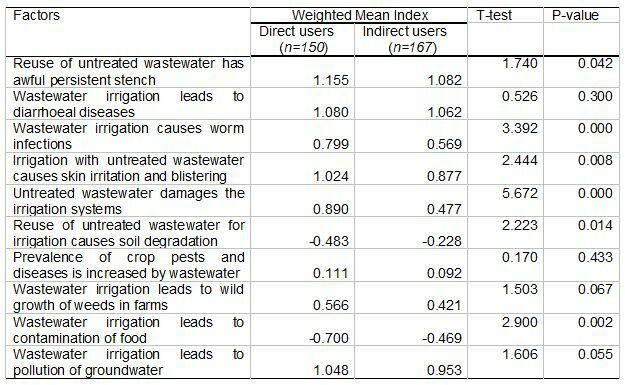 The degree of disagreement for direct wastewater users was higher and had significantly different index compared to indirect wastewater users. This is an indication that farmers are concerned about the safety of food produced through wastewater irrigation. However, the reuse of irrigation water infested with excreted bacterial, viral, protozoan, and helminthic pathogens can result in extensive food contamination (WHO, 2006). Farmers who use wastewater directly and indirectly for irrigation agriculture agreed that the resource utilization results in groundwater pollution. However, direct wastewater users had higher agreement than indirect wastewater users and had significantly different index. There are numerous challenges faced by thousands of farmers who use wastewater either directly or indirectly for irrigation in the urban and peri-urban areas. Although the Nairobi municipality and national environmental management authority (NEMA) have a responsibility to ensure protection of freshwater resources in Kenya, this is difficult due to inadequate sanitation infrastructure and scarcity of freshwater resources. The observed farmers’ negative perception of wastewater may be linked to numerous difficulties they face in overcoming the challenges in the resource reuse. There is a need to address the socioeconomic repercussions due to wastewater irrigation in order to promote the urban and peri-urban agriculture. The direct and indirect wastewater users have a role to play in influencing the perception of wastewater reuse in irrigation. This may be achieved through an adoption of precautionary measures that can lower the risks to public health and environment. The safety measures proposed by direct and indirect wastewater users in this study are presented in Table 5. The study results show that 87.07 percent of the urban and peri-urban farmers agreed that wastewater treatment before discharge into rivers would significantly reduce the health risks. Wastewater treatment can be categorized into preliminary, primary, secondary or tertiary treatment. Therefore, the most appropriate wastewater treatment in the study area is the one that would lower pathogen loading while retaining the nutrients (WHO, 2006). This is mainly because the wastewater in urban and peri-urban areas in mainly used for crop production. About 78.23 percent of farmers agreed that the use of protective clothing, boots and gloves while in the farms can minimize exposure to pathogens. This increased support to the use of protective clothing may be attributed to the perceived protection from skin infections (Trang et al., 2007; Rutkowski et al., 2007; van der Hoek et al., 2005). This is vital since many farmers interviewed did not wear protective clothing although the water they use is heavily polluted. In order to lower the risk attributed to wastewater irrigation, 62.78 percent of indirect and direct wastewater users supported the treatment of wastewater-irrigated soils against pathogens. This soil treatment involves on site immobilization of metals and metalloids, which accumulate over time due to continuous wastewater reuse in irrigation (Hamilton et al., 2007). The soil amendments consist of gypsum, lime, phosphate materials, organic matter, clay minerals, hydrous iron and manganese oxides. Another measure supported by the farmers (61.83 percent) was the application of appropriate amount of wastewater in irrigation. This entails the use of required amount and hence controlling the pollutants loading and pathogen accumulation in the soils (WHO, 2006). The application of wastewater to the roots of crops and not on leaves was considered an effective measure to reduce health and environmental risks by 57.41 percent farmers. These localized wastewater application techniques (e.g. surface and subsurface drip irrigation) are meant to lower the crop contamination through minimization of contact between polluted irrigation water and the edible parts of the crop (Pescod, 1992; Solomon et al., 2002; WHO, 2006). About 51.96 percent of the farmers agreed that the protection of urban water sources can significantly reduce the health and environmental risks in urban agriculture. This can involve an integrated management of the Motoine-Ngong River catchment to ensure sustainable utilization of the resource. The measure to reduce splashing of soils on vegetables was considered effective by 71.61% of the urban and peri-urban farmers. This is meant to minimize the possible contact between the already polluted soil and crop. Once the soil splash on vegetables is reduced, thermo-tolerant coliforms and helminths eggs can greatly be reduced (Keraita et al., 2007). The provision of freshwater to urban farmers for irrigation was considered to be a viable measure by 45.74 percent of farmers who use wastewater directly or indirectly. However, the availability of freshwater for irrigation is constrained by poor sanitation infrastructure and waste-disposal services in the study area (Jiménez and Asano, 2008; Raschid-Sally & Jayakody, 2008). Cessation of irrigation a few days before crop harvesting was the least acceptable measure to reduce health and environmental risks since only 43.53 percent of the farmers supported it. This is a non-treatment method whereby farmers cease to irrigate their crops some days before harvesting in order to reduce pathogens on the crops (Keraita et al., 2008). However, this wastewater management option can lead to extensive crop loss thus unpopular among the direct and indirect wastewater users. 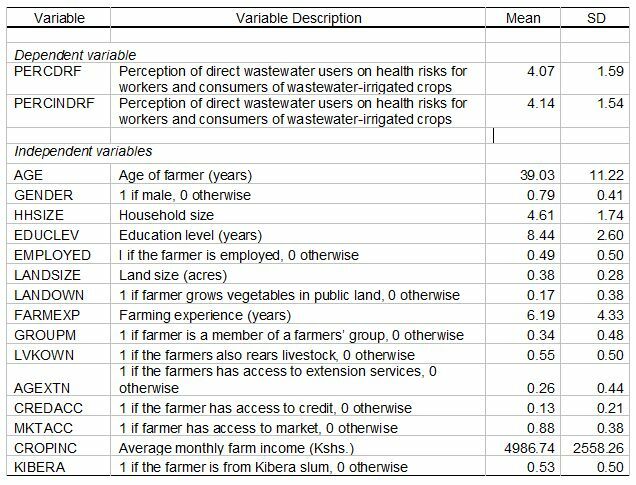 Table 6 provides the empirical computations of farmers’ perceptions on health hazards of direct and indirect wastewater irrigation obtained using the ordered probit model, which was based on maximum likelihood method. Also, the results present McFadden R2, standard errors, t-values, and log-likelihood statistics. Once the model was estimated, the marginal effects showing the likelihood of direct and indirect wastewater users to strongly perceive that wastewater reuse has health consequences were calculated as shown in Table 7. The marginal effects results show that coefficients of age, gender, household size, education level, employed, land size, farming experience, credit access, and farm income were found to be significant at 95 percent level. According to the results, coefficient for age variable is positive and significantly different from zero for direct and indirect models of wastewater users. The increase in age for direct and indirect wastewater users by a year increases the probability of strongly agreeing that wastewater irrigation has health risks to farm workers and consumers by 0.7 percent and 1 percent respectively. Education of farmers increases the probability of agreeing strongly with the perception that wastewater irrigation has health hazards. The results show that an additional year of education increases the probability of strongly agreeing perception of direct and indirect wastewater users on health effects to farm workers and consumers by 5.2 percent and 8 percent respectively. This implies that educated farmers are more cautious in utilizing the polluted water for irrigation, and they more often take precautionary measures to minimize the health risks (Knudsen et al., 2008). Similarly, each additional increase in years of farming experience increases the probability of strongly agreeing perception that wastewater irrigation has health hazards by 1 percent for direct users and 4 percent for indirect users. Since age, education level, and farming experience variables represent the human capital of farmers, their positive significance implies that the set of abilities acquired by farmers in wastewater irrigation positively influence the strongly agreeing perception that wastewater reuse has health implications to farm workers and consumers. This could be attributed to awareness gained about wastewater reuse hazards through increased education and experience in urban agriculture. Similar results about the effect of human capital on farmers’ perception have been obtained in other wastewater irrigation studies (Owusu et al., 2012; Robinson et al., 2005). The estimated marginal effects show that male farmers strongly perceive wastewater irrigation to have health effects on farm workers and consumers of wastewater irrigated crops. This may be partially attributed to the fact that men are largely involved in conveyance of wastewater to the farms. The results show that households headed by male farmers are 5.73 percent more likely to strongly agree to the perception on health implications of wastewater irrigation for direct users and 4.86 percent more likely for indirect wastewater users. Household size has a significant effect of the perception of farmers on health risks on farm workers and consumers of crops produced with wastewater. The larger household sizes are 2.5 percent more likely to agree strongly with the perception that wastewater irrigation has health risks to farm workers and consumers of produced crops for direct users and 3 percent for indirect users. This could due to the fact that the handling and transmission of wastewater to the farms is labour intensive. The negative effect of employment variable implies that farmers who have another form of employment have lower health hazard perception on wastewater use for irrigated-agriculture. Farmers who are employed are 1.6 percent less likely to perceive strongly that wastewater irrigation is linked to health hazards for direct users and 1.8 percent for indirect users. This shows that the surplus income generated from wastewater irrigation by the farmers with an alternative employment outweighs their health-risk perception of wastewater reuse. Similarly, an increase in farm size variable decreases the probability of farmers to agree strongly with the perception that untreated wastewater irrigation has negative health consequences. The unit increase in farm size lowers the probability of strongly agreeing perception that wastewater reuse has health implications by 4.2 percent for direct users and 25 percent for indirect users. The propensity of farmers to agree strongly with the perception that wastewater reuse has health hazard for farm workers and consumers is greater for farmers from Kibera slums than for those from other areas. Farmers from Kibera slums are 1.9 percent more likely to agree strongly with the perception that wastewater irrigation has health risks for direct users and 6.2 percent for indirect users. This may be attributed to high level of water pollution around Kibera slums resulting from poor sanitation infrastructure. Farmers who use public land for farming have a low agreeing perception that wastewater irrigation could cause infections on farm workers and consumers. The empirical findings show that farmers who used public plots for farming are 3.1 percent less likely to perceive strongly that wastewater irrigation is associated with health risks for direct users and 1.4 percent for indirect users. Membership to a farmers’ group increases the farmers’ probability of strongly agreeing with the perception that wastewater irrigation has health threats to farm workers and consumers of the produced crops. Farmers who belong to groups are 0.4 percent more likely to agree strongly with the perception that wastewater irrigation has health implications for direct users and 0.5 percent for indirect users. This may be due to exchange of information on safe practices that may be influence the perception of farmers involved in wastewater irrigation. Livestock ownership tend to increase the probability of farmers to agree strongly with the perception that wastewater reuse has health-related risks. Households with livestock are 1.8 percent more likely to agree strongly with the perception that wastewater irrigation has health implications for direct users and 8.6 percent for indirect users. This may be due to the fact that most livestock are grazed on vegetation near heavily polluted water sources. Access to credit variable is positive and significant for direct and indirect wastewater users. The households with access to credit have higher probability to strongly agree with the perception that wastewater reuse has negative effect on health of farm workers and consumers at 1.6 percent and 5.7 percent for direct and indirect users respectively. This is because access to credit enables farmers to acquire risk-reduction technologies in wastewater irrigation. Access to extension services increases the propensity of farmers to agree strongly with the perception that wastewater irrigation has health risks to farm workers and consumers. Farmers with access to extension services are 2.8 percent more likely to agree strongly with the perception that wastewater reuse has health consequences for direct users and 10.2 percent for indirect users. The extension services creates awareness about the public health and environmental threats posed by unregulated reuse of untreated or poorly treated wastewater for irrigated-agriculture. Therefore, increased access to extension services influences the farmers’ perception about wastewater as a resource for agricultural production. The negative influence of market access variable suggests that farmers with market access for their produce have lower health-related hazard perception on wastewater irrigation. Market access reduces the farmers’ strongly agreeing perception that wastewater has health threats by 2 percent and 4.4 percent for direct and indirect users respectively. This implies that farmers with access to market are more concerned about the economic benefits than the health risks of wastewater irrigation. The variable representing farm income is positive and significant in both the direct and indirect users’ regression models. The empirical results show that increased farm income increases the probability of strongly agreeing perception that wastewater irrigation has health risks of 1.5 percent and 3.9 percent for direct users and indirect users respectively. Farmers with high crop income could rate health-related threats lower than those who have lower crop income in wastewater-irrigated agriculture. This study was based on a cross-sectional survey data. The data was collected from a randomly selected sample of 150 direct wastewater users and 167 indirect wastewater users, involved in vegetable production in urban and peri-urban Nairobi of Kenya in 2011. The direct and indirect reuse of wastewater for irrigation agriculture is essential in water-scarce urban and peri-urban areas of Nairobi. This is because the wastewater significantly substitutes the scarce freshwater for urban agriculture. However, understanding the farmers’ perception about wastewater reuse in urban and peri-urban agriculture is vital for policy recommendation in fighting urban poverty and food insecurity is essential. The available sources of freshwater for irrigation in Nairobi are rivers and shallow wells within the Nairobi River Basin. However, inadequate sanitation infrastructure in the city has resulted in extensive pollution of these freshwater sources. This has forced many urban and peri-urban farmers in Nairobi rely on untreated wastewater either directly or indirectly for irrigation agriculture. The preliminary analysis of survey data using weighted mean index shows that farmers consider the following benefits in wastewater reuse: lack of freshwater sources; wastewater accessibility near the farm; high yields of the crops; improves soil structure; and strategic source of nutrients for plants. However, the direct and indirect wastewater users cited the following challenges in wastewater irrigation: awful persistent stench; leads to diarrhoeal diseases; causes worm infections; causes skin irritation and blistering; damages the irrigation systems; causes soil degradation; increased prevalence of crop pests and diseases; leads to wild growth of weeds in farms; leads to contamination of food; and leads to pollution of groundwater. Direct and indirect wastewater users in irrigation agriculture support the following measures to minimize health risks to farm workers and consumers of the produced vegetables: treatment of wastewater before discharge into rivers; using protective clothing, boots and gloves while in the urban farms; minimization of soil splash on grown vegetables; treatment of wastewater-irrigated soils against pathogens; application of the appropriate amount of wastewater in irrigation; application of wastewater to the roots of crops and not on leaves; protection of urban freshwater sources for reuse in irrigation; provision of freshwater to urban farmers for urban irrigation; and cessation of irrigation a few days before crop harvesting. The results show that both the direct and indirect users of wastewater for irrigation are concerned about the health-related implications of wastewater irrigation. Some of the infections reported by farmers are: diarrhoeal infection, stomach-ache, intestinal worms’ infection, and skin infections. In order to identify the factors that influence the perception of direct and indirect wastewater users on health hazards of wastewater irrigation, the ordered probit model was used in this study. The model results shows that the following factors may affect the farmers’ perception on health implications of wastewater reuse: age, gender, household size, education level, employment status, Kibera resident, land size, land ownership, farming experience, group membership, livestock ownership, credit access, agricultural extension, market access, and farm income. The following factors particularly influence perception that wastewater irrigation has health hazards: age, gender, household size, education level, farming experience, credit access, and farm income, which have significantly positive effect. Therefore, relevant policies are required in order to minimize the health hazards of wastewater reuse for urban and peri-urban agriculture in Kenya. This is mostly important in order to increase food production for rapidly rising urban population and also empower the poor urban and peri-urban farmers economically. Perception of wastewater users could be improved by organizing regular training workshops to sensitize them on health risks to farm workers and consumers. Also, all stakeholders should be involved in management of wastewater in order to ensure sustainability of urban and peri-urban agriculture. The study recommends that perception of urban and peri-urban consumers of leafy vegetables be investigated in order to provide additional policy options towards risk-reduction interventions in wastewater irrigation. This work was funded by the Organisation for Social Science Research in Eastern and Southern Africa (OSSREA). The authors are indebted to all the urban and peri-urban farmers for sharing their experiences and knowledge of wastewater reuse. 1. African Development Bank (ADB). (2010). Nairobi rivers rehabilitation and restoration program: sewerage improvement project. Project appraisal report. Nairobi: African Development Bank Group. 2. Ayers, R.S., & Westcot, D.W. (1985). Water quality for agriculture. Food and Agriculture Organization (FAO) Irrigation and Drainage Paper 29, Rev 1. Rome: Food and Agriculture Organization. 4. Buechler, S., & Devi, G. (2006). Adaptations of wastewater-irrigated farming systems: a case of Hyderabad, India. In: van Veenhuizen, R. (ed.) Cities farming for the future: urban agriculture for green and productive cities. RUAF Foundation, IDRC and IIRR. 7. Carr, R., Blumenthal, U. & Mara, D. (2004). Health guidelines for the use of wastewater in agriculture: developing realistic guidelines. In: Scott, C., Faruqui N.I. & Raschid-Sally, L. (eds.) Wastewater use in irrigated agriculture: confronting the livelihood and environmental realities. Ottawa, Canada: Commonwealth Agricultural Bureau International, Orient-Longman, and International Development Research Centre. 8. Cornish, G.A. & Kielen, N.C. (2004). Wastewater irrigation-hazard or lifeline? Empirical results from Nairobi, Kenya and Kumasi, Ghana. In: Scott, C.A., Faruqui, N.I. & Raschid-Sally, L. (eds.) Wastewater use in irrigated agriculture coordinating the livelihood and environmental realities. Wallingford: CABI Publishing. 9. Dulo, S.O. (2008). Determination of some physico-chemical parameters of the Nairobi River, Kenya. Journal of Applied Sciences and Environmental Management, 12(1), 57-62. 10. Duran-Ros, M., Puig-Bargués, J., Arbat, G., Barragán, J., & Cartagena, F.R. (2009). Effect of filter, emitter and location on clogging when using effluents. Agricultural Water Management, 96(1):67–79. 11. Drechsel, P., Graefe, S., Sonou, M., & Cofie, O.O. (2006). Informal irrigation in urban West Africa: an overview. In: Research Report 102, IWMI, Colombo, Sri Lanka. 12. Drechsel, P., Scott, C.A., Raschid-Sally, L., Redwood, M., & Bahri, A. (2010). Wastewater irrigation and health: assessing and mitigating risk in low-income countries. The International Water Management Institute and the International Development Research Centre. London: Earthscan. 14. Ensink, J.H.J., van der Hoek, W., Matsuno, Y., Munir, S., & Aslam, M.R. (2003). The use of untreated wastewater in peri-urban agriculture in Pakistan: risks and opportunities. Colombo: International Water Management Institute. 15. Ensink, J. (2006). Water quality and the risk of hookworm infection in Pakistani and Indian sewage farmers. Unpublished doctoral thesis. London: University of London. 16. Faruqui, N.I., Scott, C.A., & Raschid-Sally, L. (2004). Confronting the realities of wastewater use in irrigated agriculture: lessons learned and recommendations. In: Scott, C.A., Faruqui, N.I. & Raschid-Sally, L. (eds. ), Wastewater use in irrigated agriculture: confronting the livelihood and environmental realities. Wallingford, UK: CABI Publishing. 17. Fattal, B., Lampert, Y., & Shuval, H. (2004). A fresh look at microbial guidelines for wastewater irrigation in agriculture: a risk-assessment and cost-effectiveness approach. In: Scott, C.A., Faruqui, N.I. & Raschid-Sally, L. (eds. ), Wastewater use in irrigated agriculture: confronting the livelihood and environmental realities. Wallingford: CABI Publishing. 18. Government of Kenya. (GoK). (2006). Environmental management and co-ordination, (water quality) regulations 2006. Kenya Gazette Supplement No. 68. Legislative Supplement No. 36. Nairobi: Government Printer. 19. Government of Kenya (GoK). (2010). National water harvesting and storage management policy. Nairobi: Government Printer. 20. Greene, W.H. (2008). Econometric analysis. 6th ed. Upper Saddle River, NJ: Prentice Hall. 21. Hamilton, A.J., Stagnitti, F., Xiong, X., Kreidl, S.L., Benke, K.K., & Maher, P. (2007). Wastewater irrigation: the state of play. Vadose Zone Journal, 6(4), 823-840. 22. Jiménez, B., & Asano, T. (2008). Water reclamation and reuse around the world. In: Jiménez, B. & Asano, T. (eds. ), Water reuse: an international survey of current practice, issues and needs. London: IWA Publishing. 23. Karanja, N., Njenga, M., Prain, G., Kang'ethe, E., Kironchi, G., Githuku, C., Kinyari, P., & Mutua, G.K. (2010). Assessment of environmental and public health hazards in wastewater used for urban agriculture in Nairobi, Kenya. Tropical and Subtropical Agro-ecosystems, 12(1), 85-97. 24. Kenya National Bureau of Statistics (KNBS). (2010a). Kenya: 2009 population and housing census. Nairobi: KNBS. 25. Kenya National Bureau of Statistics (KNBS). (2010b). 2008–09 Kenya Demographic and Health Survey: Key Findings. Calverton, Maryland, USA: KNBS and ICF Macro. 26. Keraita, B.N., & Drechsel, P. (2004). Agricultural use of untreated urban wastewater in Ghana. In: Scott, C.A., Faruqui, N.I. & Raschid-Sally, L. (eds.) Wastewater use in irrigated agriculture. Wallingford, UK: CABI Publishing (pp. 101–112). 27. Keraita, B., Konradsen, F., Drechsel, P., & Abaidoo, R.C. (2007). Reducing microbial contamination on lettuce by cessation of irrigation before harvesting. Tropical Medicine and International Health, 12(2), 8–14. 28. Keraita, B., Jiménez, B., & Drechsel, P. (2008). Extent and implications of agricultural reuse of untreated, partly treated and diluted wastewater in developing countries. Agriculture, Veterinary Science, Nutrition and Natural Resources, 3(58), 1-15. 29. Knudsen, L.G., Phuc, P.D., Hiep, N.T., Samuelsen, H., Jensen, P.K., Dalsgaard, A., Raschid-Sally, L., & Konradsen, F. (2008). The fear of awful smell: Risk perceptions among farmers in Vietnam using wastewater and human excreta in agriculture. Southeast Asian Journal of Tropical Medicine and Public Health, 39(2), 341-352. 30. Liu, H., & Huang, G. (2008). Laboratory experiment on drip emitter clogging with fresh water and treated sewage effluent. Agricultural Water Management, 96(5), 745–756. 31. Menegaki, A.N., Hanley, N., & Tsagarakis, K.P. (2007). The social acceptability and valuation of recycled water in Crete: a study of consumers’ and farmers’ attitudes. Ecological Economics, 62, 7-18. 32. Mojida, M.A. Wyseureb, G.C.L., Biswasa, S.K., & Hossaina, A.B.M.Z. (2010). Farmers’ perceptions and knowledge in using wastewater for irrigation at twelve peri-urban areas and two sugar mill areas in Bangladesh. Agricultural Water Management, 98, 79–86. 33. Nabulo, G, Oryem-Origa, H., & George, W. (2008). Assessment of heavy metal contamination of food crops in wetlands and from vehicle emissions. In: Cole, D.C., Lee-Smith, D. & Nasinyama, G.W. (eds. ), Healthy city harvests: Generating evidence to guide policy on urban agriculture. Lima, Peru: CIP/Urban harvest and Makerere University Press. 34. National Environment Management Authority (NEMA). (2011a). Kenya: state of the environment and outlook 2010. Supporting the delivery of vision 2030. Summary for decision makers. Malta: Progress Press. 35. National Environment Management Authority (NEMA). (2011b). Rehabilitation and Restoration of Nairobi River Basin programme. Nairobi: National Environment Management Authority. 36. Owusu, V., Bakang, J.E.A., Robert Clement Abaidoo, R.C., & Modeste Lawakilea Kinane, M.L. (2012). Perception on untreated wastewater irrigation for vegetable production in Ghana. Environment, Development and Sustainability, 14, 135-150. 37. Pescod, M.B. (ed.). (1992). Wastewater treatment and use in agriculture. Food and Agriculture Organization (FAO) Irrigation and Drainage Paper 47. Rome: Food and Agriculture. 38. Qadir, M., & Scott, C.A. (2010). Non-pathogenic trade-offs of wastewater irrigation. In: Drechsel, P., Scott, C.A., Raschid-Sally, L., Redwood, M. and Bahri, A. 2010 (eds.) Wastewater irrigation and health: assessing and mitigating risk in low-income countries. London: Earthscan. 39. 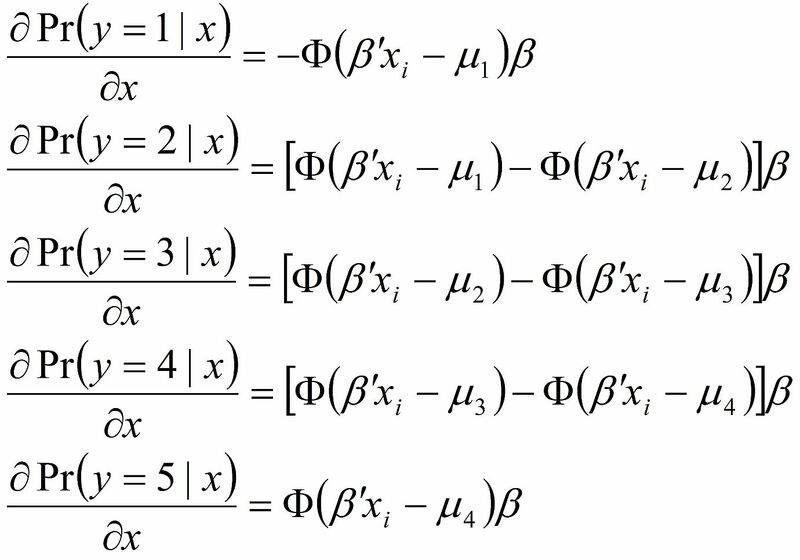 Qadir, M., Sharma, B.R., Bruggeman, A., Choukr-Allah, R., & Karajeh, F. (2007). Nonconventional water resources and opportunities for water augmentation to achieve food security in water scarce countries. Agricultural Water Management, 87, 2-22. 40. Qadir, M., Wichelns, D. Raschid-Sally, L., McCornick, P.G., Drechsel, P., Bahri, A., & Minhas, P.S. (2010). The challenges of wastewater irrigation in developing countries. Agricultural Water Management, 97, 561-568. 41. Raschid-Sally, L., & Jayakody, P. (2008). Drivers and characteristics of wastewater agriculture in developing countries: results from a global assessment, Colombo, Sri Lanka. IWMI Research Report 127. Colombo, Sri Lanka: International Water Management Institute. 42. Robinson, K.G., Robinson, C.H., & Hawkins, S.A. (2005). Assessment of public perception regarding wastewater reuse. Water Science and Technology: Water Supply, 5(1), 59-65. 43. Rutkowski, T., Raschid-Sally, L., & Buechler, S. (2007). Wastewater irrigation in the developing world: two case studies from the Kathmandu Valley in Nepal. Agricultural Water Management, 88, 83-91. 44. Scott, C.A., Faruqui, N.I. and Raschid-Sally, L. (2004). Wastewater use in irrigated agriculture: Management challenges in developing countries. In: Scott, C.A., Faruqui, N.I. & Raschid-Sally, L. (eds.) Wastewater use in irrigated agriculture: confronting the livelihood and environmental realities. Wallingford: CABI Publishing. 45. Solomon, E.B., Potenski, C.J. and Matthews, K.R. (2002). Effect of irrigation method on transmission to and persistence of Escherichia coli O157:H7 on lettuce. Journal of Food Protection, 65(4), 673-676. 46. Srinivasan, J.T., & Reddy, V.R. (2009). Impact of irrigation water quality on human health: A case study in India. Ecological Economics, 68, 2800-2807. 47. Trang, D.T., van der Hoek, W., Tuan, N.D., Cam, P.C., Viet, V.H., Luu, D.D., Konradsen, F., & Dalsgaard, A. (2007). Skin disease among farmers using wastewater in rice cultivation in Nam Dinh, Vietnam. Tropical Medicine and International Health, 12(2), 51-58. 49. United Nations Human Settlements Programme (UN-HABITAT). (2009). Planning sustainable cities: global report on human settlements 2009. Nairobi: United Nations Human Settlements Programme. 51. Van der Hoek, W. (2004). A framework for a global assessment of the extent of wastewater irrigation: the need for a common wastewater typology. In: Scott, C.A., Farunqui, N.I., Raschid-Sally, L. (eds.) Wastewater use in irrigated agriculture, confronting the livelihood and environmental realities. Trowbridge: International Development Research Centre. 52. Van der Hoek, W., Anh, V.T., Cam, P.D., Vicheth, C., & Dalsgaard, A. (2005). Skin diseases among people using urban wastewater in Phnom Penh. Urban Agriculture Magazine, 14, 30-31. 53. World Health Orgnaization (WHO). (2006). Guidelines for the Safe Use of Wastewater, Excreta and Greywater. Geneva: World Health Organization. Ndunda, Ezekiel N., and Eric D. Mungatana. “Farmers’ Perception and Knowledge of Health Risks in Wastewater Irrigation.” Open Science Repository Natural Resources and Conservation Online.open-access (2013): e70081917. Ndunda, Ezekiel N., and Eric D. Mungatana. “Farmers’ Perception and Knowledge of Health Risks in Wastewater Irrigation.” Open Science Repository Natural Resources and Conservation Online, no. open-access (January 16, 2013): e70081917. http://www.open-science-repository.com/farmers-perception-and-knowledge-of-health-risks-in-wastewater-irrigation.html. Ndunda, E.N. & Mungatana, E.D., 2013. Farmers’ Perception and Knowledge of Health Risks in Wastewater Irrigation. Open Science Repository Natural Resources and Conservation, Online(open-access), p.e70081917. Available at: http://www.open-science-repository.com/farmers-perception-and-knowledge-of-health-risks-in-wastewater-irrigation.html. 1. Ndunda, E. N. & Mungatana, E. D. Farmers’ Perception and Knowledge of Health Risks in Wastewater Irrigation. Open Science Repository Natural Resources and Conservation Online, e70081917 (2013). 1. E. N. Ndunda, E. D. Mungatana, Farmers’ Perception and Knowledge of Health Risks in Wastewater Irrigation, Open Science Repository Natural Resources and Conservation Online, e70081917 (2013). Research registered in the DOI resolution system as: 10.7392/Research.70081917. The article is really useful for the students and the research fellows. Thank you.